Maritime ceramics and glassware continue to thrive as a niche section in Bearnes Hampton & Littlewood's Maritime sale. Locally produced Bovey Tracey pottery mess plates and bowls have always been popular with maritime ceramic collectors, particularly those searching for matching numbers on the blue and white pattern mess bowls and mess plates. 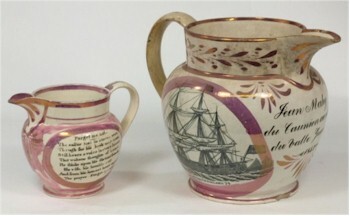 Garrison (Sunderland) pottery ship jugs such as these often fetch between £200 and £300 in our maritime sales. Elsinore bowls decorated with ship portraits and maritime motifs are steady in the market, as are maritime decorated Sunderland pottery ship jugs, plates and ship bowls. These Sunderland pottery pieces are easily identified by their iridescent lustre finish and maritime verse. Named examples of Sunderland pottery such as Dixon & Co, Garrison and Scott regularly fetch between £200-300 at auction. The pinnacle of maritime ceramics over the past year has been Polar expedition table wares, specially commissioned for Polar voyages. Two Polar expedition plates from the British Arctic Expedition 1875-1876 aboard HMS Alert sold well above estimate in 2012 at £660 and £550 each. 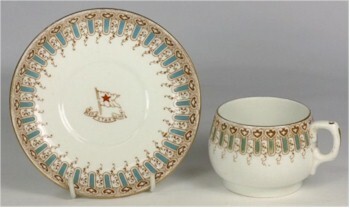 Pieces such as this Red Star Line, A Stonier & Co Ltd (Liverpool) porcelain coffee cup and saucer are sought by those interested in Ocean liner memorabilia. Within the maritime ceramics, collectors continue to favour White Star Line table wares. Even small pieces, such as a White Star line asparagus dish, generate great interest, even with a modest £200-£300 estimate as in this case. No doubt, the lure of the White Star Line and its history added to the value for collectors. P&O and Red Star line are also sought after by many others looking for a piece of Ocean liner memorabilia, from an age when travel was more sophisticated and sedate on a luxury Ocean liner. Maritime ceramics and glassware that relate to the career and life of Admiral Nelson continue to be popular with buyers and collectors, even though the bi-centenary of Nelson's death at the Battle of Trafalgar has passed. Still considered by many to have been the greatest Admiral of the fleet, Nelson decorated pieces hold a strong position in the market. In particular, any period pieces from Nelsons' early career at the Battle of the Nile and his time aboard HMS Foudroyant regularly command high prices at auction.